Is there such a thing as a triumph of substance over style? If there is, Netflix’s new docuseries might be an example of it. Dark Tourist theoretically has everything I love. It takes a totally affable curator (David Farrier), a guy whose ethical, down-to-earth manner and charming New Zealand accent are a great foil for his subject area: “dark” tourism, where people deliberately go to places most people are desperate to avoid (like combat zones, or nuclear disaster sites, or a small village terrorized by rampaging killer bees-not literally killer bees, at least not that I saw, but you get the picture). There are tourist industries set up to cater to adrenaline junkies, disaster rubberneckers, people who adore the macabre, and lovers of the kinds of history that tends to get left out of the books. Farrier covers the globe documenting them: from an unbelievably tacky JFK assassination tour in Dallas (complete with a Jackie impersonator) to busload of very antsy people carrying Geiger counters through the ruins of Fukushima, Japan, to an “interview with some vampires” in New Orleans and a Segway scooter tour of a war-torn borderland in Cyprus where if you turn one way you might crash your absurd scooter and if you turn the other way you might be shot by angry military guards. So I was a little surprised to be underwhelmed by the series, which is a solid idea and not badly constructed. Why didn’t I completely love every minute of it? One thing that hit me was that it might have been useful to know a little more about Farrier’s angle; it was sometimes hard to tell if he is himself a “dark tourist” or someone trying to understand them (depending on the episode, you might draw either conclusion). He has a flat-affect deadpan delivery style that is faintly reminiscent of a Flight of the Conchords character. Like, he’s so laid-back it’s almost funny and then almost weird and then almost funny and then almost uninteresting and then actually funny and then slightly disaffecting and… are you with me here? That. Anyway, he’s wall-to-wall likable. And to be fair, he presents himself as a journalist, and neutrality and dispassion are good traits in a journalist in many situations. He might be slightly too dispassionate for this medium. I’m not sure I’ve made up my mind about that yet. For whatever reason—probably a combination of some locations being more inherently interesting than others and the genial but diffident personality of the host—the episodes are quite uneven in their impact. The United States episode focuses on a clan of vampires who make the guys from Twilight seem positively insouciant, plus the flatline-inducing JFK assassination tour and an even sadder one whose “dark” appeal is someone who takes you on a tour of sites associated with serial killer Jeffrey Dahmer and has the nerve to take people’s money and then use dowsing rods to suggest Dahmer’s ghost is tagging along. (A visit to Dahmer’s lawyer is redemptively interesting but it’s definitely journalism versus tourism). A trip to Southeast Asia to observe some unusual rituals around mummified corpses is genuinely intriguing. The Latin America episode is probably the standout, as Farrier tracks a Mexican “death cult,” gets some surprises—bringing me back to the scene of that terrible time when I had to watch a Discovery Channel show about Pablo Escobar’s hidden treasure (the sicario known as “Popeye” and Escobar’s ex sister-in-law have apparently gotten quite used to the camera)—and most poignantly, sheds some light on a cottage industry I had no idea existed: Apparently you can “fake” an illegal border crossing over the Rio Grande, complete with coyotes, guns, bandits, severe dehydration and an eleventh hour capture by “immigration.” This might sound especially disgusting, but it was by far the most interesting segment, as one comes to understand that the point of the exercise is to show people how desperate you actually have to be to try getting into the United States this way. It’s a well-orchestrated mimicry (by someone who had in the past been paid to get people out of Mexico), and gets very emotional for nearly everyone, including Farrier. So: The episodes are uneven and the host, while affable, is sometimes a little too removed from what he’s doing to be totally attention-grabbing. I expect the “dark tourism” industry’s surface has barely been scratched in this season, and if there’s a second one I hope for a slightly more fixed relationship between host and material, because it’s currently a little hard to work out whether Farrier is a “dark tourist” or a “dark tourism tourist.” And as it turns out, it makes a difference. In the moments when he gets discernably emotionally involved, the show has some sparkle. In his more deadpan units, it can be slightly lank. 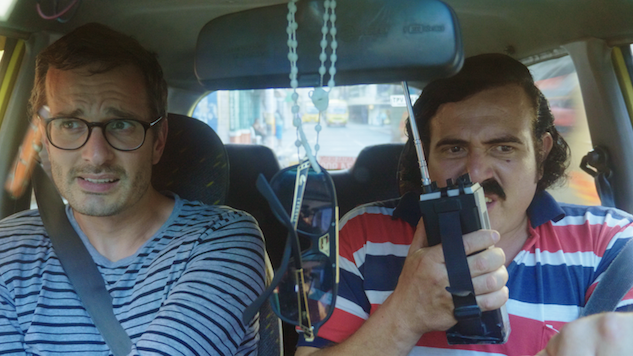 Dark Tourist is now streaming on Netflix.